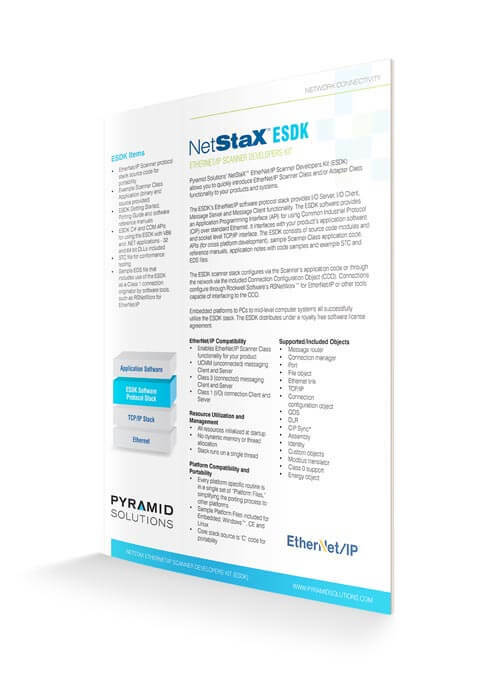 Pyramid Solutions’ NetStaX™ EtherNet/IP™ Scanner Development Kit (ESDK) with Scanner Class Stack allows you to quickly introduce EtherNet/IP Scanner (client) Class and/or Adapter (server) Class functionality to your products and systems. 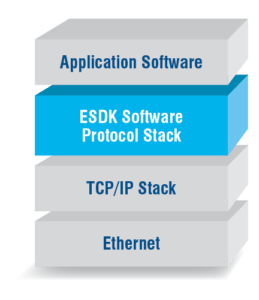 The ESDK software protocol stack provides I/O Server, I/O Client, message server and message client functionality, and an application programming interface (API) for using Common Industrial Protocol (CIP) over standard Ethernet. The ESDK software interfaces with your product’s application software and socket level TCP/IP interface. Configure the ESDK scanner stack via the Scanner’s application code or through the network via the included connection configuration object (CCO). Users can configure connections through Rockwell Software’s RSNetWorx™ for EtherNet/IP or other tools capable of interfacing to the CCO. The ESDK source code uses an object-oriented approach. ESDK building blocks, such as TCP/IP sessions, CIP connections, explicit requests, and all implemented CIP objects, including assemblies, are grouped into separate modules with corresponding functionality. This makes the source code easy to understand and debug.